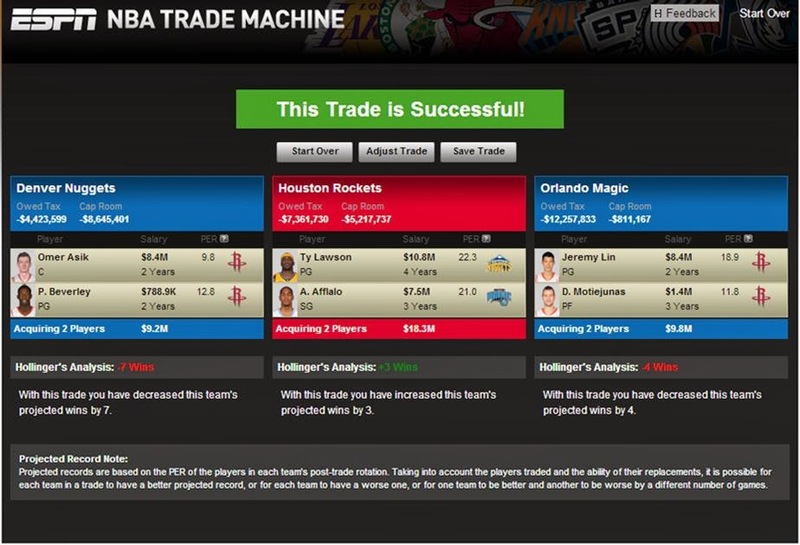 In Part 1 and Part 2, I made some fantastic fake trades with Coach Hubie Brown's help. But what does the league look like now? 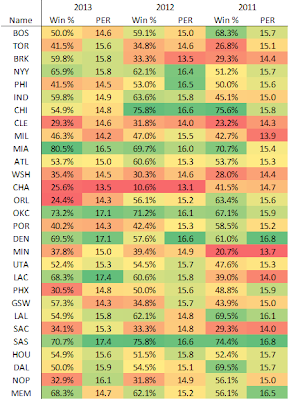 Here, I'll break down each team's optimal starting 5 and top 3 bench players, their respective PERs, and my projected win total for that team. I'll sort these in order of projected finishing record. How did I come up with the records? The Hollinger analysis on the ESPN Trade Machine uses a combination of PER and other factors. I thought it would be interesting to regress the total PER of a team's top 8 (by minutes played) against their regular season record for the last 3 years and see how strong of an indicator PER is. I thought about using a weighted-average PER as PER is a per-play effectiveness stat and for many players decrease as they play more minutes, but decided that this effect should be relatively uniform across the league (i.e. each team has players that play great for <= 20 minutes a game). Also, I ran out of time. PER is the average of the team's top 8 players by minutes played. Color codes indicate ranking for that particular year. XING (@youmakethecalls): The first thing I need to do is correct a mistake I made in Part 1. Well, not really a mistake. You see, I don't have the heart to send Andrew Bogut to wither away in the Boston cold on a team that clearly doesn't want him. I needed him to make the salaries work, but isn't there another way? COACH HUBIE BROWN - how do you feel about the big Australian? COACH HUBIE: You know, it's funny you should ask, because I never actually got coach against Andrew. He came into the league after my last year in Memphis. I have, however, had the chance to do his games, and let me tell you - he is one of the most underrated players of his generation. A former No. 1 pick that is a legitimate center, can play on the block both offensively and defensively, and is a great passer. Everyone I've talked to about him, whether it's coaches or players, have nothing but good things to say about him. He came into the league at a time when the style of play was really changing - you know, Shaq was the last great true center. Anyway, I feel like he, and Yao Ming, too, were caught in an awkward situation where the league was transitioning to a more open, drive-and-kick style, and they were real throwback players. So I think history has not been kind to him in that regard. The Philadelphia Eagles have been a markedly improved team in 2013. With the Cowboys, Giants, and Redskins spiraling downwards, the Eagles have seized command of the division (at least as much as losing by double digits to Minnesota qualifies as "seizing command"). With 2 games left, it is likely that they will challenge for the division crown when they visit Dallas in Week 17, if they haven't won it already. Part of the Philly narrative is well known: Chip Kelly's explosive offense scheme extends defenses horizontally, vertically, and in terms of preparation and conditioning. However, the offense has taken its lumps, notably going two straight games without an offensive touchdown in October. Some context: Philly was using its 3rd string quarterback, Matt Barkley, who is wholly unqualified to play in the NFL (watch his USC tape - he is terribly inaccurate and relied on great receivers to make catches outside of their frames). I have been waiting for December 16 for a long time. Why? Because on December 15th, NBA players signed during the summer became eligible for trades! Finally! After several months mired in QB analysis, I can look to basketball for a reprieve. As many of you saw, Bill Simmons has a new video on Grantland where he takes the ESPN Trade Machine for a spin with Coach Doug Collins. But he only spoke to a handful of teams. Not to be out-done, I invited the venerable Coach Hubie Brown to debate over trade scenarios involving all of the league’s 30 teams. Hallelujah! XING: Coach, when the Houston Rockets signed Dwight Howard this summer, surely they did not imagine only a 16-9 record by the season’s first quarter mark. That record is good for…fifth place in the West! Their point differential of +4.8 is 1.3 better than last year but is far behind the 10.2 posted by San Antonio (holy crap!). Houston is also the reason I had to put this up quickly: their self-mandated deadline to trade Omer Asik is only 3 days away. Coach, what’s wrong with the Rockets? COACH HUBIE: Well, Xing, when you put one defense-oriented player with four others that are uncommitted on that end, you’re going to struggle guarding the ball. They just don’t have any strong perimeter defenders on the roster. XING: Let the dealing begin! Over a week ago, QB Corner examined the Week 10 Panthers @ 49ers game looking specifically at a young quarterback's development. That QB was the 49ers' Colin Kaepernick, but he was not the only nascent signal caller in the game. His opposition, Cam Newton, began his NFL career with much success and hoopla, but has since proven uneven as a passer and leader, only recently putting together an impressive series of wins. In this column, I will examine Cam's performance in the Panthers' win and see where his development stands in relation to Colin's.